500 ml & 300 ml handwash bottle available. bell shaped hand washed bottle. in transperant colour. 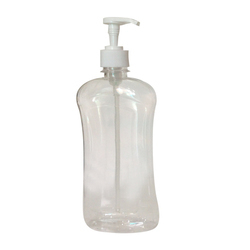 we are manufacturer of Handwash Bottle in various size in HDPE and PP material only. This is best new product in market this is very usage of Hand wash bottle. these bottles are used for filling handwash and liquide wash.
WE ARE MANUFACTURER OF ALL KIND OF HANDWASH PET BOTTLES, AS PER CUSTOMERS REQUIREMENTS. WE BELIEVE IN QUALITY PRODUCTS AND CUSTOMERS SATISFACTION. WE UNDERSTAND THE IMPORTANCE OF PACKAGING INDUSTRY SO TIME TO TIME DELIVERY IS OUR PRIORITY FACTOR. We are dedicatedly involved in providing an excellent quality array of SS Liquid Soap Bottle, for catering the various needs of our clients.